So much of the Internet of Things is still in the gee-whiz stage that we haven’t seen much in terms of nuanced IoT strategies. By that I mean ones that carefully weigh tradeoffs between companies and consumers to try to find strategies that are mutually beneficial and recognize there are new factors at play in IoT strategies, such as privacy and data mining, that may have positive or negative consequences for the customer/company interplay. Deloitte’s “University” has made an important step in that direction with its “Power Struggle: Customers, companies and the Internet of Things” paper, co-authored by Brenna Sniderman and Michael E. Raynor. In it, they explore how to create sustainable strategies that will be mutually beneficial to the customer and company — which are not always immediately apparent, especially when you explore the subtleties of how these strategies might play out in the new reality of the Internet of Things. The study’s goal was to understand the factors that can distort IoT’s benefits, and instead create win-win IoT strategies. (the sweet spot!) “All’s well: Sufficient value is created, and that value is shared between customers and companies sufficiently equitably such that both parties are better off and feel fairly treated. “Hobson’s choice: A Hobson’s choice exists when you’re free to decide but only one option exists; thus, it is really no choice at all…. Even when customers come out ahead compared with their former options, their implied powerlessness can lead to feelings of unfairness. “Gridlock: In their quest for value capture, both sides are pulled in opposite directions, with neither able to move toward an optimal outcome. Here, both parties recognize IoT enablement as something that should lead to success, but neither party is able to reach it, since their competing interests or different value drivers are working at cross purposes. According to the authors, a key to finding the win-win, “all’s well” solution is the Information Value Loop (which I first discussed last Spring) that creates value out of the vast increase in information made possible by the IoT. As I mentioned then, “This fits nicely with one of my IoT ‘Essential Truths,’ that we need to turn linear information flows into cyclical ones to fully capitalize on the IoT.” When you do that, it’s possible to design continuous improvement processes that feed back data from actual users to fine tune products and processes. GE has found it leads to much shorter iterative loops to design improved versions of its products. “A value loop is sustainable when both parties capture sufficient value, in ways that respect important non-financial sensibilities. For example, retailer-specific and independent shopping apps can use past browsing and purchasing history—along with other behaviors—to suggest targeted products to particular customers, rather than showing everyone the same generic products, as on a store shelf. Customers get what they want, and companies sell more. OK, so how does this theory play out? Understanding the underlying structure of each type of loop is critical, because they naturally pull an IoT strategy in a particular, divergent way. “Customers often have little understanding of which repairs are necessary, feel inconvenienced by having to go without their car during maintenance periods, and are frustrated by potential overcharges. In response, automakers are embedding sensors that can run a wide range of reliable diagnostics, allowing a car to “self-identify” service issues, rather than relying on customers (“Where’s that squeaking coming from?”) or mechanics (“You might want to replace those brake pads, since I’ve already got the wheels off”). This creates a level of objectivity of obvious customer value and enables automakers to differentiate their products. Interactive features that work with customers’ information can further add value by, for example, potentially syncing with an owner’s calendar to schedule a dealership appointment at a convenient time and reserving a loaner vehicle for the customer, pre-programmed with his preferences to minimize the frustration of driving an unfamiliar car. In this scenario, both parties collaborate to provide and act on data, in a mutual exchange of value. The customer captures value in multiple ways: He enjoys increased convenience and decreased frustration, improved vehicle performance and longer operating life, reduced maintenance charges, and—since almost everything about this interaction is automated—fewer occasions for perceived exploitation at the hands of unscrupulous service providers. Kumbaya! But then there’s the opposite extreme, according to Sniderman and Raynor, represented by smart home devices, which would lead to the lose-lose, gridlock scenario. I think they seriously underestimate the understanding already by manufacturers in the field that they need to embrace open standards in order to avoid a range of competing standards (Zigbee, Bluetooth, etc.) that will force consumers to invest in a variety of proprietary, incompatible hubs, and therefore discourage them from buying anything at all. All you have to do is look at new hubs, such as Amazon’s Echo, which can control devices from WeMo, Hue, Quirky, Wink — you name ’em, to realize that sharing data is already the norm with smart home devices. Because this missive is getting long, I’ll leave it to you, dear reader, to investigate Sniderman & Raynor’s examples of the “customer is king” scenario, in which the customer grabs too much of the benefit (have to admit, a lot of the location-based IoT retail incentives still give me the creeps: I hate shopping under the best of circumstances, and having something pop up on my phone offering me an incentive based on my past purchases makes a bad experience even worse. How about you? ); and the “Hobson’s choice” one, in which usage-based car insurance runs amok and insurers begin to charge unsafe drivers a surcharge — as documented by the devices such as Progressive’s “Snapshot” (I was dismayed to read in the article that Progressive is in fact doing that in Missouri, although I guess it’s a logical consequence of having objective evidence that someone consistently drives unsafely). I can’t help thinking that the 800-pound gorilla in the room in many of these situations are the Scylla and Charybdis of the IoT, threats to privacy and security, and that makes it even more important that your IoT strategies are well thought out. “Identifying where the bottlenecks lie (using the Information Value Loop), how each party is motivated to respond, and seeking to shape both incentives and the value loop itself puts companies more in control of their destinies. 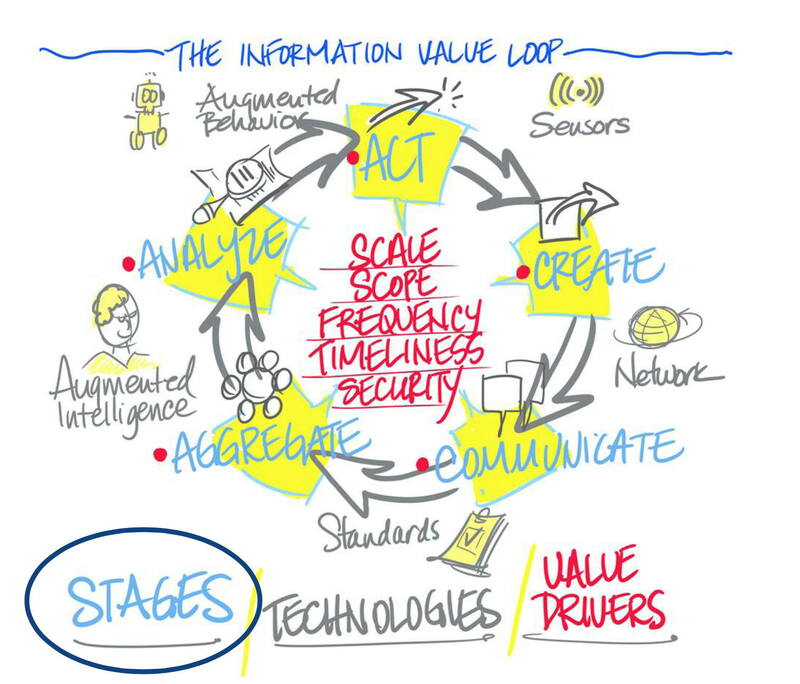 “Second, taking a hard look at who benefits most from each IoT-enabled transaction, understanding when a lopsided value-capture outcome tips too far and becomes unsustainable, and taking steps to correct it may also lead to long-term success. I may quibble with some of their findings, such as those about smart homes, but bravo to Sniderman and Raynor for beginning what I hope is a spirited and sustained dialogue about how to create sustainable, mutually-advantageous IoT strategies! I’ve weighed in with my Essential Truths, but what are you thinking about this critical issue, often overlooked in our concentration on IoT technologies? Ever so often it’s good to step back from the day-to-day minutia of current Internet of Things projects, and get some perspective on the long-term prospects and challenges. The attendees included two of my idols: John Seely Brown and John Hagel, of Deloitte’s “Center for the Edge” (love the pun in that title!). 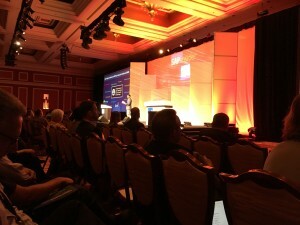 IMHO, this is also going to be one of the biggest challenges of the IoT for management: in the days when it was sooo difficult to gather and disseminate information, it made sense for those in the C-suite to control it, and parcel out what they felt was relevant, to whom and when they felt it was relevant. More often than not, the flow was linear and hierarchical, with one information silo in the company handing on the results to the next after they’d processed it. That didn’t allow any of the critical advantages the IoT brings, of allowing everyone who needs it to share real-time data instantly. But saying we need to change those information management practices is one thing: actually having senior management give up their gatekeeper functions is another, and shouldn’t be understated as a challenge. Melding the public and private, “Cities have inherent societal challenges in place to serve as natural incubators of IoT solutions.” Yeah! It’s likely that those players in the IoT ecosystem who create value-added data interpretation will be the most valuable and profitable: “…are certain building blocks of the IoT network “more equal” than others? I urge you to download and closely analyze the entire report. It’s one of the most thoughtful and visionary pieces of IoT theory I’ve seen (no doubt because of its roundtable origins: in keeping with the above-mentioned need for cyclical information flow for the IoT [and, IMHO, creativity in general], the more insights you can bring together on a real-time basis, the richer the outcome. Bravo! 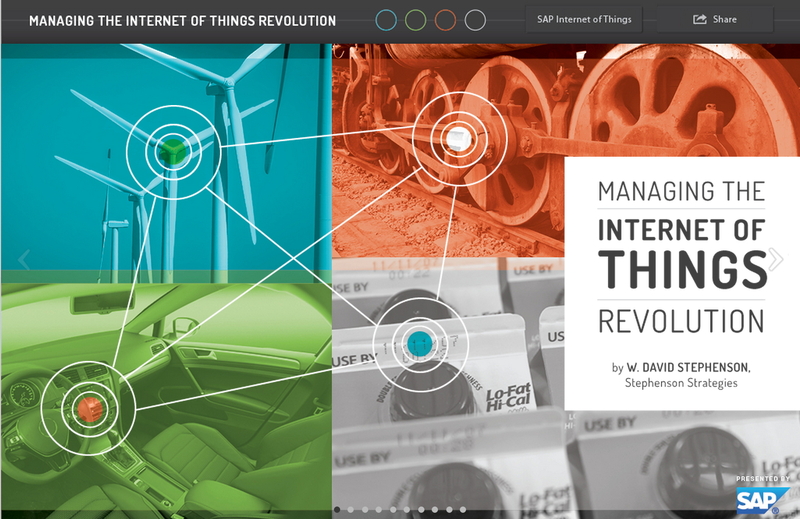 The “Managing the Internet of Things Revolution” e-guide I wrote for SAP was aimed at C-level executives. Even though it’s proven popular enough that the company is translating it into several languages, it appears we need to redouble our efforts to build IoT awareness among executives. I say that because Gartner has just come out with a survey confirming my suspicions: even though a lot of companies now think the IoT will have a major effect on them, they’re clueless about how to manage it and most have yet to launch major IoT initiatives. That’s despite the fact that a key conclusion of my guide was that (even though the IoT is a long way from full maturity) companies can and should begin their IoT strategies and implementation now, because they can already achieve significant savings in operating costs, improve marketing, and create new revenue streams with the current early stage sensors and analytical tools. Getting started will also build their confidence and familiarity with IoT tools and strategy before they begin more dramatic transformational strategies. 40% of companies think the IoT will at least bring new short-term revenue and cost reduction opportunities in the next three years — or perhaps even transform them. More than 60% think that will be true over 5 years or more. Fewer than 25% said their company had “established clear business leadership for the IoT,” — even among the companies predicting a significant – this includes those who said they expect the IoT to have a significant or transformational impact, says Gartner (however, 35% of them came from this group). If you haven’t launched any IoT projects or begun to create a strategy, the writing’s on the wall: get going! 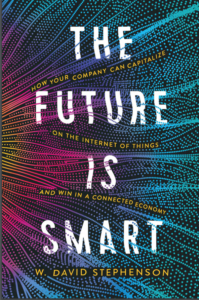 Carpe diem: I take this survey as an omen that there’s a desperate need for When Things Can Talk: profiting from the Internet of Things revolution,” my proposed full-length book on IoT corporate strategy. Let me know if you can suggest a possible publisher!